Teresa Pocock's Petition to CCAC and Rekai Centre: Say you are Sorry! Teresa Pocock's Petition to CCAC and Rekai Centre: Say you are Sorry! Home › Petition › Human Rights Should Never Be Disabled. Forced into LongTerm Care at 49, Teresa wants apology. By Franke James on Change.org. With the stroke of a pen, my disabled sister’s human right to decide where she lives was wrongly taken away. In a heart-breaking move, Teresa who has Down syndrome, was forced against her will into an old-age nursing home, by the CCAC and two of my siblings. Four days later, she was rescued by my 91-year old father who was “adamant” he did not want his daughter living in a nursing home. But then the nursing home called the police, in a shockingly callous and bizarre effort to force her back. Teresa called the CCAC’s apology “beautiful”, but we have not won yet… The Rekai Centre has not responded. We need the Rekai Centre CEO, Mary Hoare, to offer a full and public apology for the harm they caused Teresa. The truth is that if we had not rescued Teresa from the nursing home, she would have been living in an institution — with no right to choose otherwise — for the rest of her life. How could this happen in Canada? That’s what Teresa and her supporters want to know. And Teresa is not the only one being hurt. Developmentally disabled people are routinely being forced into inappropriate “care”. This is wrong. And it is having a catastrophic effect on the lives of so many people like Teresa. Please sign our petition to help stop the discrimination against “disabled” people in our health care system. Please sign Teresa’s petition, because human rights should never be disabled. I presented Teresa’s harrowing story to the Select Committee on Developmental Services at the Ontario Legislature. (Teresa was present and consented to her health records being shared.) You can see the slide presentation I made on January 21st, which lays out the full sequence of events. Why is there NO accountability? How could the rights of a developmentally disabled person be removed so easily? Teresa’s story shows how it was done, and why we need to hold the institutions, and those responsible, accountable — so that it does not happen to anyone else. Teresa’s plight shows that there is NO accountability. This is ironic… If you drive too fast, you’ll get a speeding ticket. If you litter, you can face a hefty fine. But if you incorrectly take away the rights of a person with Down syndrome and place that person in a nursing home, NOTHING happens! There is no penalty and the health care institutions will not even say they are sorry! After her discharge, Teresa wanted to regain the ‘capacity’ rights that the CCAC had taken away. Teresa wanted to make her own decisions about where she lived and who cared for her. So, in late December and January, Teresa was interviewed and assessed by an expert licensed capacity assessor who determined that Teresa is in fact capable of deciding where she lives. Teresa’s case shows that our consent and capacity laws are woefully inadequate to protect the rights of the developmentally disabled. 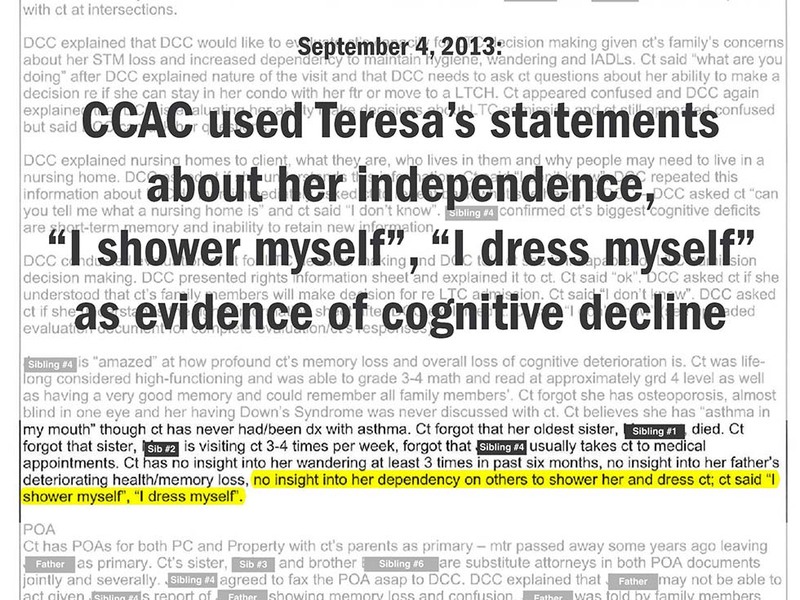 How were Teresa’s rights taken away by the CCAC? In a heart-breaking move, my lively 49-year old sister with Down syndrome, was stripped of her human rights and placed in a nursing home where she was surrounded by frail elderly people, many of whom were incapacitated and could not walk, talk or feed themselves. Last fall, with the stroke of a pen, CCAC-Toronto wrongly declared Teresa “incapable” and recommended her placement in a long-term care institution in November 2013. The CCAC records are riddled with false information. (I have obtained the records as Teresa’s new Power of Attorney for Personal Care.) Teresa was incorrectly described as needing 24/7 care. They incorrectly stated that she needed assistance to use the toilet and dress her lower body. Teresa was falsely depicted as a ‘wanderer’ and ‘violent’, but when those descriptions prohibited Teresa from most long-term care homes, they were retracted. Teresa’s own statements about her independence (“I can dress myself. I can shower myself”) were used as examples of her insidious cognitive decline. Why would the CCAC inaccurately portray Teresa’s abilities? I won’t speculate on the “why”, but the fact is that the CCAC’s incorrect health profiling enabled her to get to the top of the Crisis List, and into a long-term care home. Why did the Rekai Centre call the police? Teresa spent four days in the Rekai Centre before we could get her discharged. On November 30th, my 91-year old father who had Senior Power of Attorney, signed Teresa out. That day, I spoke with the CEO of the Rekai Centre, Mary Hoare, and informed her that Teresa would be living with me. I sent her an email on December 1st confirming everything. But then in a move which I can only describe as cruel and callous, the Rekai Centre reported Teresa as a “missing person”. On December 4th, three burly policemen were sent to my home to take Teresa forcibly back to the nursing home. 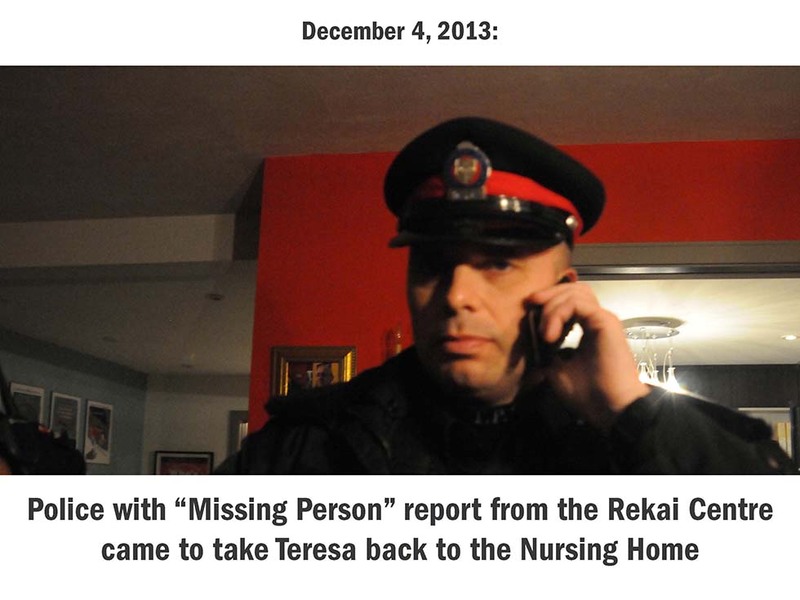 The fact that the Rekai Centre sent the police to take Teresa back is shocking and traumatizing. Why did they send the police four days after Teresa was discharged? Why didn’t the Rekai Centre just pick up the phone or email me? They knew where she was because they sent the police to my home! Teresa now lives with me. We need to stand strong to protect the rights of developmentally disabled people so that what Teresa experienced does not happen to anyone else. Please sign Teresa’s petition Thank you in advance for your support! I hope they do the right thing Teresa. It was a pleasure meeting you and Franke and Bill yesterday.